If you’ve been hanging around Facebook at all lately, you’ve probably seen this ad, complete with its clickbait headline. (Note: any ad whose title contains the words “a little known trick” is clickbait. But you knew that.) Sounds legit, right? 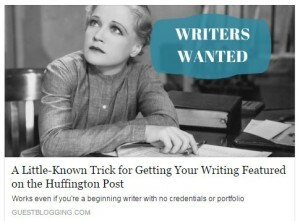 I mean, everybody wants to write for the Huffington Post. It’s a huge name in online media, and having a post there gives you legitimacy (and, hopefully, eyeballs on your other work) like whoa.